Perhaps an old Viking would have a hard time recognizing this as his own ship, but all of the elements of the ship are here: striped sail, flat hull, oars, colorful shields, and the all-seeing eye. 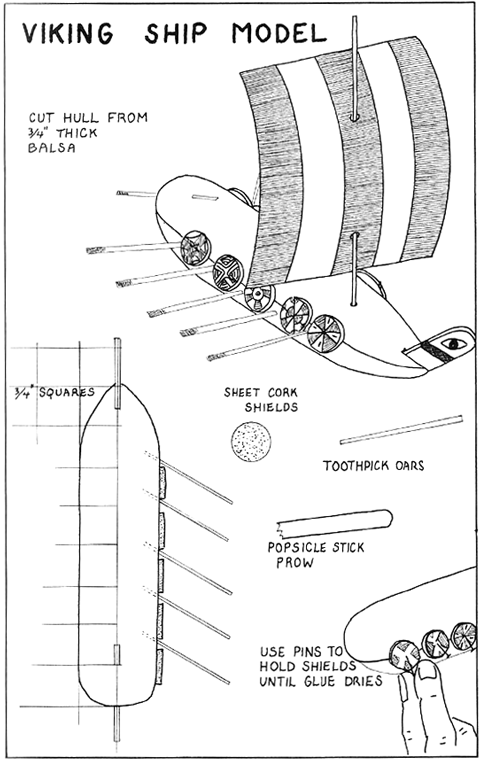 Learn how to make this toy Viking Ship with the following instructions. This is a project that requires adult assistance and supervision. (Parental Assistance and Supervision Required) Necessary for each ship are: balsa 3/4 by 2 by 61/4 inches, a thin stick 5 1/2 inches long, 11 toothpicks, 10 sheet cork circles 3/4 inch in diameter, half a popsicle stick, and paper 4 by 5 inches. The hulls can be made cheaply by buying balsa in chunk form, and cutting mass-production style on a bandsaw. If power equipment is unavailable, rough-cut the balsa with a carpenter saw to blanks 3/4 by 2 by 61/4 inches, make cardboard patterns for the children to trace around, and let them cut the curves with coping saws. After the hull is cut, round and smooth the edges with a sand-block and garnet paper. Saw a slot in the front for the popsicle-stick prow. Using watercolors as dry as possible, paint the hull,and put an eye on the prow. The Vikings put eyes on the prows of their ships in the belief that the eye would make the ship see its way, and they would not get lost (something went wrong on the voyage to America). While the hull is drying, paint the shields, which are made beforehand by punching out circles from thin sheet cork. As with the hull, keep the paint as dry as possible, and it will dry in a few minutes. Sheet cork takes watercolors beautifully. Put a dab of glue on the back of each shield, and fasten to the hull temporarily with a straight pin. Remove pins after glue has set. Prepare a sail 4 by 5 inches. Either use Christmas wrapping with stripes, or paint stripes on the sail with watercolors. The Vikings generally made their sails in red and white or blue and white stripes. Some say this had religious or magical significance, and others that the colors were used because these were the ones the Vikings knew how to make best. At any rate, the stripes were there, since their cloth was woven in narrow widths, and even today it is recognized that sails are stronger if made in this fashion. The oars are toothpicks, and are pushed into the hull with a bit of glue on the ends. The toothpicks stick easily into the soft balsa, but if preferred, punch starting holes with an awl first. For the best effect, push all the oars on each side in at about the same angle. The steering oar is pushed up through the back of the hull, with the thin end poking out for a tiller effect. Paint the tips of the oars a bright color. The final step is inserting the mast. Make a starting hole in the deck with an awl, put glue on the end of the stick, and push into place.